Rumba is more than music and dance—it is the expression of Cuba’s creole identity. The music is a hybrid, blending Congolese percussion and flamenco-style soul-baring singing in the Yoruba language. It is rhythmic, dark, intense—one of the island’s first and enduring sounds, and one that has changed little since the colonial era. I see a man and a woman doing a rooster-hen dance. Soon, other dancers join. At some point, it becomes a drum-fuelled marathon with spectators piling in. The air is thick and soupy, the beat relentless. Finally, I’ve had enough and elbow my way out of the tiny corridor and head toward the work of local painter Salvador González Escalona, who started plastering the walls of this back alley with vivid murals in 1990, bringing a sacred space to this poorest part of town. Four centuries ago, African slaves brought to Cuba by the Spanish were forbidden to practise their native religion. They resisted by fusing African deities with Catholic saints, worshipping them like the Spanish did, but imbuing them with their own gods’ characteristics. So the super-macho African God, Shango, became Santa Barbara, a woman clothed in the red colour associated with her fiery African counterpart; Oya, the undergoddess of the Niger River, became the Virgin of Candelaria. Over time, they genuinely integrated customs and beliefs from the Spanish. Some white Creoles—native born Cubans of European descent—adopted African practices too, and continue to do so. Santería is growing in every sector of the community, more publicly so since the mid-1990s, as the government started to show a new tolerance towards religion. You can spend weeks in Cuba, learn about the Revolution, cigars, the proportion of Cadillacs to Chevrolets, and how to live on ration books, and yet learn nothing about Afro-Cuban culture. This is due not to the lotus-eating indolence of tourists, but the secrecy in which Santería is cloaked. 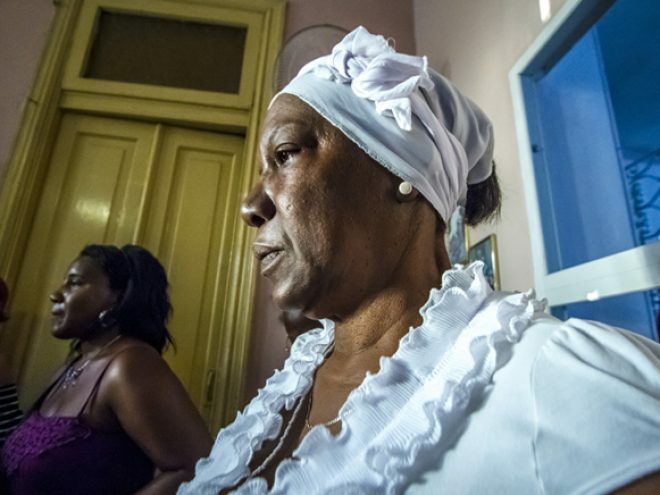 This township in eastern Havana, once a major trading centre for slaves, has a marked Afro-Cuban musical and cultural identity strongly associated with Santería; the secret brotherhood of Abakuá and Palo Monte, a nature-worship cult. It’s one of those barrios where the potencia—literally, spiritual potency–is strong. I go there with Tomás, a Santería practitioner who runs grassroots Santería tours in Havana for the uninitiated. The Museo Histórico de Guanabacoa tells a compelling story of the evolution of Afro Cuban culture. Here, clever, youthful guides will prep you on the main deities, from maternal Yemaya to firebrand Shango. My guide, José, tells me that you cannot understand Cuba until you know Santería, which is present in the way Cubans eat, dress, speak, think and act. He also tells me Santería, because of its natural-born secrecy, could never be suppressed during the austere Communist years in the way Catholicism was. Next stop is the Babalawo, the high priest. Tomás takes me to the top guy in his neighborhood, Diez de Octubre. The Babalawo is a tall white man in his sixties, who is quietly dignified. I ask for a consultation and I offer him some money. (He makes the sign of the cross with it before pocketing it.) He says he will consult Olorun—the divination aspect of the great divine entity—about my past, present and future, and leads me into a bare kitchen. He begins by writing details of my name and date of birth, then embarks on a ritual of chanting in Yoruba (invoking his ancestors to clarify his mind, Tomás advises), splashing water from half a coconut shell, tapping the table, clicking his fingers and throwing a chain hung with discs of coconut rind on to the table. He keeps telling me to keep my open palms towards him. I am slightly distracted by the sound of a squealing pig somewhere in the house – Tomas tells me that there is an initiation ceremony going on as we speak, when the faithful make official their association with Santería through days of intense ritual and animal sacrifice. Then his wife bursts in and makes everyone coffee, he lights up a cigarette and starts chatting with Tomás . The famous Cuban pragmatism is not diluted by any magic at work, and it puts me at ease. Later that evening, slightly perturbed by this onslaught, I read up on Oya. She is a warrior woman who raises tornadoes and hurricanes, and who guards the underworld. Ever since meeting Tomás, I can’t help noticing motifs of Santería everywhere I go: discarded herbs on street corners; “initiated” Cubans wearing white from head to toe (even their earrings, shoes and umbrellas); strange artefacts and animal bones in the surf. One day, crossing the Rio Almendares, I look down the lush, iridescent green vista of palm smothered banks. On a boulder at the river edge is a smiling woman about to chop a chicken’s head off into the swirling emerald waters. Santería is everywhere, if you choose to see it. Lydia Bell travelled with Esencia Experiences (01481 714 898; esenciaexperiences.com), which offers a seven-day Santería-themed holiday to Cuba from £1,590pp, including Virgin Atlantic flights from Gatwick, B&B at the Saratoga Hotel in Havana, an expert-led half-day Santería tour with a visit to a rumba and the Museo Histórico de Guanabacoa.